This is definitely not for the sentimental bride who wants to take her dress to the dry cleaners and have it carefully packed away for future generations to wear – or not. This is a trend for the fearless bride who has a different romantic notion about her dress and a different sentimental attachment to it; she’s planning on wearing it again in a different way and giving it a second life after she’s worn it on her special day. Most wedding photographers who are taking your wedding photos will, for an extra fee, take some more of your waist-deep in the ocean the next day or when you return from your honeymoon. 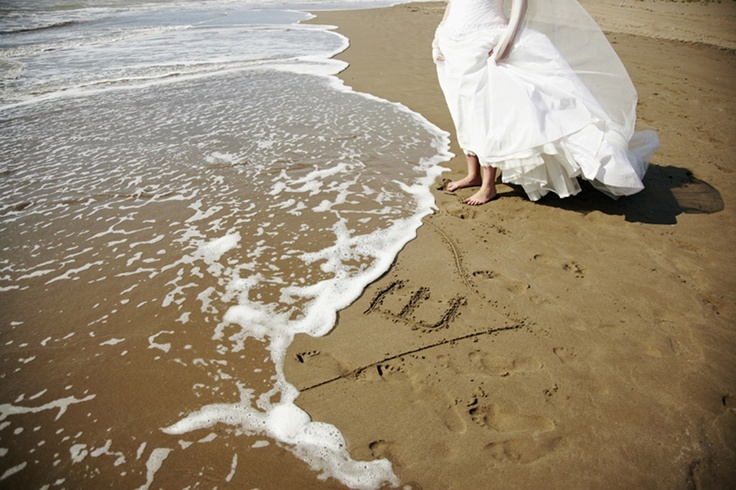 Of course, you don’t have to restrict yourself to wading in the ocean or a river – but do be careful and make sure that the weight of your wet wedding dress won’t cause you to be swept away. If you are planning a wedding in Italy the wedding photographer will know what you’re talking about – he/she won’t just think you’re another crazy American when you ask for your ‘fearless bridal’ photos – the ‘Trash the Dress’ craze is already popular in Europe. Your options for becoming a fearless bride and trashing your dress are almost limitless: you can do any normal activity such as posing by the Mediterranean Sea – and then run into the water; or pose on a nice seaweed-covered rock – both of which will ruin your dress. Dive into the nearest swimming pool – preferably off the diving board; go snorkeling and have your wedding photographer take photos with an underwater camera. Go skydiving – if you dare! As you’re planning to have your wedding in Tuscany why not see if you can stomp on some grapes in your wedding dress? It’ll certainly make for some memorable photos and your dress will definitely be trashed as those wine stains will never come out! You don’t have to perform your fearless bridal stunt while you’re in Tuscany; you can wait until you get home and head out to a local carnival and drag your dress through the dust, or take a long hike in the woods among the muddy trails and thorny bushes. Do not, however trash your dress while wearing your bridal shoes – you may want to wear them later – substitute a pair of old shoes, boots or sneakers for your expensive wedding footwear. All kidding aside, the aim of the ‘Trash the Dress’ is contrasting the elegant gown with an environment in which it is out of place. At BeA Alfresco Wedding – together with our wedding photographers – we will be happy to help you in evaluating if the ‘Trash the Dress’ is a good option for you and in finding the perfect location where to get your pictures taken.